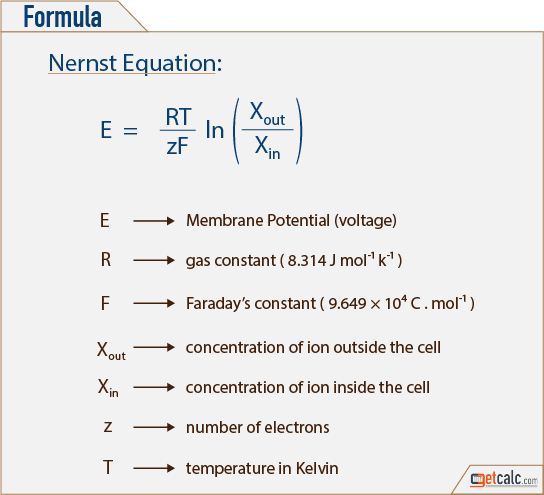 getcalc.com's Nernst Equation Calculator is an online chemical engineering tool to estimate the relationship between cell potential difference (voltage) measured across the membrane under non-standard and equilibrium conditions, in both US customary & metric (SI) units. Nernst Equation is an equation that represents relationship between the concentrations of an ion under non-standard and equilibrium conditions. It's one of the most important equations in chemical engineering to balance a chemical gradient that exists for the ion in question.